I’ve always been reluctant to allow gentlemen friends to buy me electronics. Such big purchases and usually what they think I should have rather than what I would like. But we must know by now that I’ve got issues. Another being my resistance to CDs after having a not so easy transition from album to cassette tape. But my stereo already had a dual tape deck so I did make the transition on my own and when I wanted. Then both album and tape were out and CDs were in. I didn’t have a CD player so I just went without. A couple of men I had dated over a few year span of time had offered to buy me a CD player, were even anxious to do so, but I said nay. Then one day, oh about 10 or more years ago, the ex (who was indeed ex then) comes over to take me out for my birthday. He steps in the door and hands me my present. It was wrapped but I could tell it was obviously a CD and being that I had nothing on which to play it, I cheerfully opened it and thanked him sincerely and convincingly I thought when I saw it was Eurythmics Greatest Hits. “I forgot,” he said, “do you have a CD player?” “Well, no,” I replied a little embarrassed at being found out. He opened the front door, stepped out and came back in with the box that contained my first and only CD player. It has come in handy for the radio, the tape deck and I have the turntable hooked up to it. I’m wondering now since I need to build up my CD collection if it isn’t time to invest in something new. I’ve a feeling that it’s been the cause of by broken cassettes as I now have to open the tape deck door with the aid of a paperclip, and there is this new MP3 thing I should look into. But it was nice of the ex, wasn’t it? 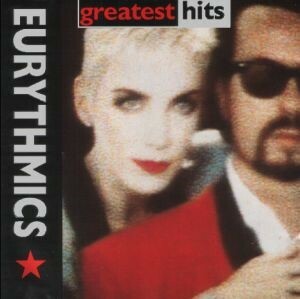 The Eurythmics was a good choice too. I didn’t have any music by them until this CD that was released in 1991, the year after they broke up, though they do get back together now and again. Dave Stewart was the other half of the duo that featured the awesome Annie Lennox. What a voice, what a presence. Her characters; male, female and androgynous were so well executed as they seemed more innate than gimmicky. Her male character Earl, that I remember first seeing at the Grammys hosted by the late John Denver, was ripped off by the reigning gimmick queen, Lady Gaga, who’s made a career of being a pretty good copycat, capitalizing on the fact that history repeats itself and most of us have short memories. I suppose her shtick is new to her fans and that’s fine. I know nothing of her music as it’s of no interest to me, but I have heard her speak in conversation and she’s no idiot. The Eurythmics CD, my first CD, provided an adequate workout and will not be brought out again for that purpose.